Hello C-Dory Owners! We are not new to boating but are new to making a decision on whether to go 22" C-Dory or 21" Ranger tug EC but having trouble deciding. We understand both boats are excellent in so many ways and are great quality as well. We understand the difference in terms of speed and cabin size since we have been on both. Our concerns are over other differences and we want to see if anyone else shared similar concerns and found solutions through modifications. The cockpit: Has anyone modified with fold down benches to make it more lounge like. Jeanneau boats small cabin cruiser, the Marlin 695 has fold down benches for four and of course the Ranger has a nice cockpit for lounging. I want benches to lay out on and not chairs- Has anyone modified with permanent benches and have pictures? Is the cockpit just too small too accommodate lounging? We saw one at the boat show ands because it was bare, i could not conceive a solution for creating a more lounge like atmosphere and lounging outdoors on a boat is important to us. Also, one of us is claustrophobic and so the small opening for the cuddy is discouraging me. Can one side be opened up without compromising the structural integrity of the boat? We had a Macgregor 26x for years and absolutely loved it on the Sound, Lake Chelan and the Columbia river for both boating and camping. It had wonderful accommodations in the cockpit and cabin and was great for cruising. However we wanted to downsize for launching purposes and because the Macgregor was dang hard to dock in winds due to high freeboard. The 21 EC has bow thrusters and are supposed to dock like a dream. How are C-dorys for docking in windy conditions? I am not seeing bow thrusters as typical on the 22's. Thanks for any insight from your experiences. I have considered the Ranger 21 (EC) as more of a "day boat"--cocktail cruiser. The newer ones had Bow thrusters--the original did not. I have operated both, and they are maneuverable without the thruster. There is a bit more windage with the c Dory--but I consider even a single engine C Dory as a very easy boat to maneuver. I believe one or two may have fitted a bow thruster--but certainly not the type of boat which needs one--and there would be a number of disadvantages. Yes, it is common to open up the bulkhead on the port side between the salon and cockpit--even better to do this on the 25 as on my current boat, where the entire bulkhead is removed. There is a "sliding forward seat" on some of the 22's. But with a fixed seat--I would find the cut out bulkhead a bit awkward. Where is the back rest for the aft facing seat"
There have been folding benches across the back. I have owned boats (not C Dory) with benches on each side--this is very easy to do--but it then compromises the cockpit for fishing etc. We just use storage boxes at the same height in out 22's to make "benches" for sitting or lying on. With the 25, there is plenty of room for several chairs as well as the built in aft seat. Many of the newer (after 2002) 22's have a level slightly raised floor in the cockpit. Previous boats, the cockpit floor is the bottom of the hull. Those who own twin engine 22's claim the boats are more maneuverable. I have only had the Tom Cat with twin 150's and several larger trawler power boats with inboard engines to compare. I have only owned one boat with a bow thruster--that was a 32' diesel trawler with a single 150 hp engine, and a high super structure--I used the thruster occasionally, but most of the time docking was easy without. I don't think the 22 cockpit is really big enough for lounging. It is only about 4.5 ft fore and aft. Also, on the port side you have to have room for the door to open. We use folding chairs that can be moved out of the way if necessary. I find that the 22 has pretty high windage. The flat bottom doesn't help. Docking or maneuvering a narrow fairway in a crosswind can be quite interesting. The wind wants to swing the cabin end (bow) downwind fairly smartly once steerage way is lost. The person handling the lines needs to be pretty decisive when it comes to throwing lines and/or jumping off the boat at the dock. Everybody needs to pay attention to both ends of the boat in these situations. We find that the factory cut out for the v-berth is satisfactory. It keeps the berth more private and separated from the main cabin. My wife was concerned at first about the berth, but now calls it "cozy". Personally, I have a hard time comparing a Ranger 21 and a C-Dory 22. They are totally different boats. The similarity being in length. After that it is like comparing horses and cows: They both have a tail (steering wheel), they both have 4 legs (mechanical power), and they both have a head (cabin door) and they both have ears (V-Birth), BUT they are SO different. It sounds like most of your boating is lake and protected water. The R-21 can do that. It would scare me spitless to have it in anything more that 3 foot waves or 15 knot winds. A CD-22, especially with twin outboards will easily handle those conditions, and is plenty maneuverable. As to lounging in the cockpit, the CD-22 would be cozy for 2, nearly impossible for 3 or more to stretch out in, unless they are side by side athwart-ships. I have seen 22 C-Dorys with hammocks in various places, and may be an option, both forward over the fore-deck and in the cockpit. As to being claustrophobic, a counter intuitive cure for that in the C-Dory is to go into the birth head first. When entered that way, and laying in there with the head up near the anchor locker, the view looking aft is of the whole cabin and out the aft cabin door (window). This has worked for some folks I know and makes the V-birth seem much larger. Sounds to me like a Marinaut would fit the bill of what you're looking for if you could find one! Larger V-birth opening and with the removable bulk head you'd have more space. Once again, good luck finding one! Two Happy: Welcome to the group. As others have said, they are two completely different boats. What is your main goal? More cruising? Fishing and cruising? Solely day trips? Or maybe some multi day trips from time to time? The Ranger is definitely more polished and refined. No doubt about that. The fit and finish is a step up from the 22. But many Brats prefer the more utilitarian design of the C Dory. I can't comment to the ride on a Ranger 21EC but I can comment on the 16, 19 and 25 C Dories. These are very sea worthy boats. They will take much MORE than the captain can take. So if that's important to you than I would give the nod to the 22 over the Ranger 21 EC. The EC seems more like a river vessel or calm water boat IMO. A C Dory can handle some relatively big ocean seas (I can attest to that). Another major difference is the speed. A 22 can cruise all day long at 20 knots +. I don't think an 21EC can do that. Have you also joined the Tug Nuts site (Ranger Tugs forum). I would definitely post a thread over there too. It would be great to hear from the 21 EC owners. I must admit though...I love the look of those little tugs! Very cool! A bow thruster is definitely sweet too. No doubt about that. Also: As to your claustrophobia point. Yes, the vberth plastic can be cut to open up the area. IT IS NOT STRUCTURAL ON ANY OF THE C DORYS and many Brats have done this mod. IMO it's a good mod for bigger folks. That opening is a tad tight (even on a 25). 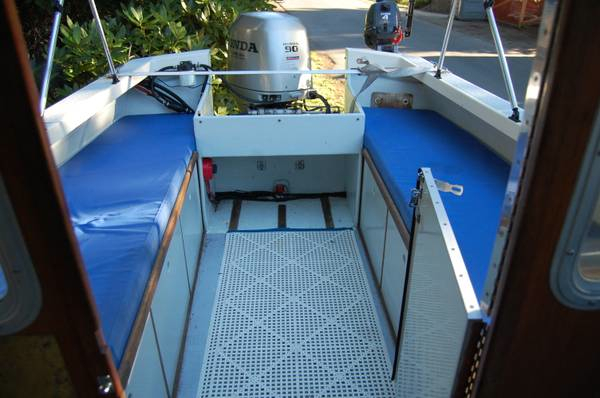 Sometimes I look at pictures of the C Dory cruisers on the inside of the cabin and it makes me want one of those. My reality is I have an angler and I have a big family. When we go out I am so glad we have the larger cockpit of around 6'. We use deck chairs and an ice chest for a bench across the back. I guess to get the best of both worlds you would have to buy a bigger boat! (that is not happening anytime soon for me) Part of the C Dory philosophy is keeping it simple and making work what you can afford. That's why I am part of this club! Good luck! I remember looking for a C-Dory after having sailboats (including a 26x). While we opted for a C-Dory 25, the 22 was on our short list. The Ranger 21 wasn't, because of the limited speed and the tiny cabin. As others here have said: while you can overnight on an R-21, it is more of a day boat from my perspective. You will find your boating style changes when you move from a 26x to a powercruiser, and especially a C-Dory. I, too, had concerns about no bench type seating in the cockpit (something that almost all sailboats have). Comfortable camp chairs with your feet propped up on a cooler or the coaming is very comfortable. But, the BIG difference is in that great cabin. And the protected helm in the cabin. You don't take a beating due to weather. As we have ... um... matured, we have learned to limit our sun exposure. The cabin of the C-Dory gives you great views without being in the sun, rain, wind. At the end of the day, you won't be wiped due to the weather exposure. This also means you will stay out longer, more comfortably. And the speed to get to where you want to go. Yes, I am aware that the 26x can go faster than most similar sized sailboats under power. That is meek compared to the speeds you will get with the C-Dory... and you won't be sitting right in front of the outboard or have to be concerned about "rudders and centerboard up or down?". A more compact form factor compared to the 26x, but a far more efficient layout. You will be able to stand up in the cabin. When you sit at the dinette, you will have a great view all around you. If you want to cook at the galley while cruising along, you and the first mate will be able to visit without yelling, and you will both be out of the weather. The CD-22 or 25 will be easier to dock than the 26x. Definitely easier to rig for launching and retrieving. The C-Dory has a more solid build. Moving around the boat, especially from the cockpit to the cabin is easier. At the end of the day, the sunsets are the same. The wonder of the trip is the same. But, the execution is different... having done both, we greatly prefer the C-Dory experience. Good luck with the decisions. Not to discourage you regarding the c-dory,a great vessel, but you may want to check out the Rosborough line. We had a RF25 for several years. These boats are very amenable to modification or use "as is". Good luck. This is not my boat but I remember seeing it and liking the layout for benches in a C Dory. The Rosborough is a nice boat. Still allegedly trailerable, it is a bit bigger boat than the 22 and 25. Primarily in height. The hull is less flat and you can actually stand up in the berth area. The sliding door at the helm is nice for landings. It seems that Rosborough is pushing the outboard powered versions lately (mounted on a hull extension). This keeps the cockpit open. IMO the RF is a bit more open and airy than the C-Dory. But this also makes it less cozy. I saw one at a boat show last year that had a davit crane and a small hard dinghy that was stored on the extended hard top. Seemed like a pretty good set up. If I was looking for a boat in that size class, the RF would be on my short list. You might want to look at the Ranger 23. That pix is of a C-Dory Classic, (Pre 1990ish) I believe. The main ID factor is the boxed Splash well for a single only OB. The cabin is shorter on that model, closer to the 22 Angler dimensions. That would give the space for the longer side benches in the cockpit. Posted: Sat Feb 09, 2019 12:40 pm Post subject: Thank You For All The Great Information!!! WOW! Wonderful responses to get us thinking more in line with overall and long term goals. After seeing the benches in the angler's cockpit we think that could work. Will post a question about v-berth size. I don't see any reason we could not fabricate an interior and exterior to suit us. Two Happy I sent you 2 Private messages--one giving the approximate V berth sizes in the 22 and 25.